This versatile recipe goes from starter to light meal in no time flat. The veggies added to the tofu bring color and flavor to this fun dish. 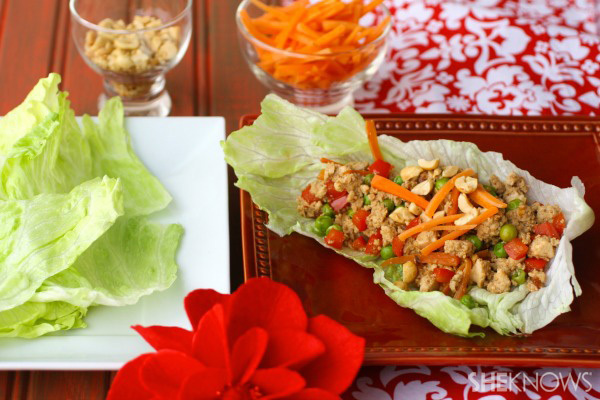 Served on a Meatless Monday, this recipe for quick and easy tofu and veggie lettuce wraps often takes me from appetizer to light meal, depending on what else is going on! Protein-packed tofu is filling, and, by adding several hearty vegetables, you can easily make a meal out of this. However you serve this dish — whether appetizer or main dish — the flavors and colors are vibrant. It’s fun to let guests make their own portions and watch them enjoy their creations. Roll up the lettuce leaves stuffed with the filling (think tacos) or simply scoop up the filling and add it to the bowl-like leaves of whichever lettuce you decide to use. One of my favorite things about this dish (I have several!) is that it’s a great way to clean out your veggie bin: if you don’t have red pepper, use celery. No peas? Go for mushrooms. Whatever you like or have, go for it! Consider making a bit extra sauce and serve it on the side. Add all the ingredients to a bowl and mix well. Taste and adjust the seasoning as needed. Set aside. Add the oil to a large skillet over medium heat. When hot, add the onion and cook for approximately 6-8 minutes, or until the onion is soft and translucent. Add almost all the carrot, reserving some to use as garnish, along with the red pepper. Cook, stirring, for 3 minutes. Add the tofu and stir, crumbling it up with the back of a wooden spoon. Cook for about 3 minutes. Add the peas and the sauce and cook until everything is warmed through. Spoon the mixture into the center of the lettuce leaves and garnish with the carrots and chopped nuts.